Jean-Pierre Saccomani - "The Four Seasons"
Jean-Pierre Saccomani is a French electronic musician who plays flowing meditative tapestries that are very much in the New Age realm, but does display some hints of more cosmic experimentation. 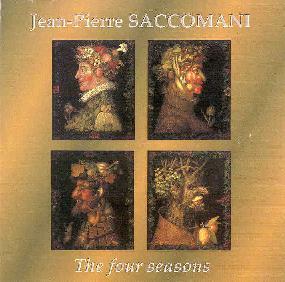 Saccomani's music is similar to Tales, and indeed there are clear ties to Tales as special thanks are given to Jean-Luc Berthelot (Mr. Tales himself) and Berthelot did the sleeve design. "The Four Seasons" has 5 tracks, but the bulk of the CD is the first four which... you guessed it... are titled after the four seasons. The music may be a bit "fluffy" for AI readers but my life is hectic enough that I'm always happy to close my eyes and float away with music that allows me to chill out and forget the time for a while. Classical influences appear throughout and I enjoyed the bouncy harpsichord sounds on "Summer" in particular. But interspersed with all this are somewhat more adventurous spacey segments that try to utilize a variety of interesting sounds while retaining their contemplative mood. In summary, "The Four Seasons" may be a bit on the New Agey side but it's still a lot more enjoyable than Yanni and the like.